Shop for 2018 1oz Gold Maple Leaf coins and add one of the world's most successful bullion coins to your collection. These iconic coins are popular with investors for their gold content while collectors enjoy the unique design and security features that make the 1oz Gold Maple Leaf stand out from the crowd. 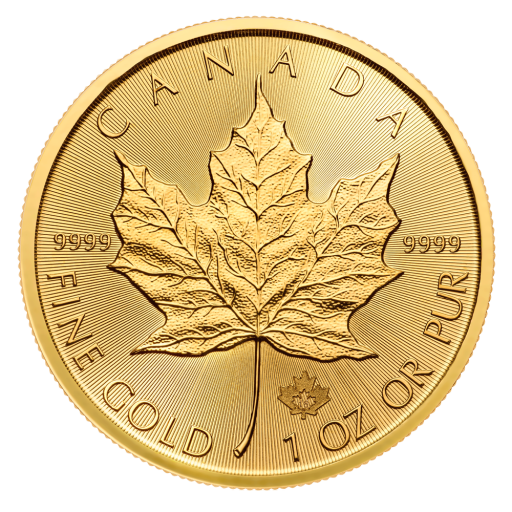 The 1oz Gold Maple Leaf coin is the official bullion coin of Canada as well as the Royal Canadian Mint's signature product. First issued as a .999 pure gold coin in 1979 as a competitor to the South African Krugerrand, the only other investment coin available at that time, the Maple Leaf was an immediate success. The coin's purity was raised to .9999/1000 (24 carat) in November 1982, making it one of the purest gold coins on today's market. The Royal Canadian Mint is well known for the quality of its products and special editions have included several .99999 Maple Leaf coins and a 100 kg Gold Maple Leaf with a face value of $1 million (CAD). The 2018 1oz Gold Maple Leaf coin is one of the most eagerly anticipated releases of the year. Demand for these outstanding coins is always high and exclusive design and security features ensure lasting interest in the Canadian Maple Leaf. The coin's reverse carries a stylised image of a sugar maple leaf, one of the most widely recognised symbols of Canada. Like all currently circulating Canadian coinage, the obverse of the 1oz 2018 Maple Leaf features the famous portrait of HM Queen Elizabeth II by artist Susanna Blunt. Both the reverse and obverse of this fascinating coin are further enhanced by a background of light refracting radial lines. Add the 2018 1oz Gold Canadian Maple Leaf coin to your basket with coininvest.com. We stock a wide selection of Canadian gold and silver coins including the Canada 150 Voyager alongside leading investment coins from around the world.